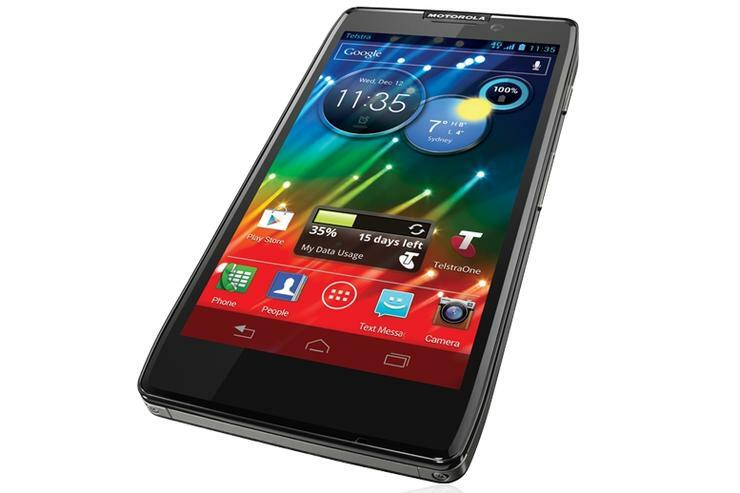 The 4G-capable Motorola RAZR HD, coming soon to Telstra. Motorola has announced that two of its new 4G Android smartphones — the RAZR HD and the RAZR M — will exclusively be sold in Australia through Telstra. Officially unveiled at a launch event in New York overnight, both the Motorola RAZR HD and the Motorola RAZR M will work on Telstra's 1800MHz 4G LTE network and will be released Down Under before the end of the year. Motorola has not announced specific local availability, but both phones are expected to be released sometime between October and December. Motorola describes the larger RAZR HD as "the world’s most compact 4.7in smartphone," measuring just 8.4mm thin. Both the RAZR HD and the smaller RAZR M feature a gorilla glass screen, a Kevlar fibre backing and a splash-guard coating that makes the phones "water-repellent". In addition to the outside of the handsets, Motorola has also coated the internal components with the splash-guard material. The Motorola RAZR HD and the RAZR M are both powered by a 1.5GHz dual-core processor, have 1GB of RAM, feature a microSD card slot for memory expansion and have an 8-megapixel rear camera. Both models will initially ship with Android 4.0 Ice Cream Sandwich software, but Motorola says an update to the latest 4.1 Jelly Bean version will arrive before the end of the year. The new Motorola 4G smartphones come a little over a week after Telstra announced the expansion of its 4G mobile network coverage, promising to cover 66 per cent of the Australian population by mid-2013. Current Telstra 4G smartphones sold in Australia include the HTC One XL, the HTC Velocity 4G, the Samsung Galaxy S II 4G and the HTC Titan 4G, while the telco confirmed earlier this week that the Samsung Galaxy S III 4G would be released in October. Telstra has set up a page on its Web site for users wishing to register their interest for the Motorola RAZR HD and RAZR M smartphones. Pricing has yet to be announced.